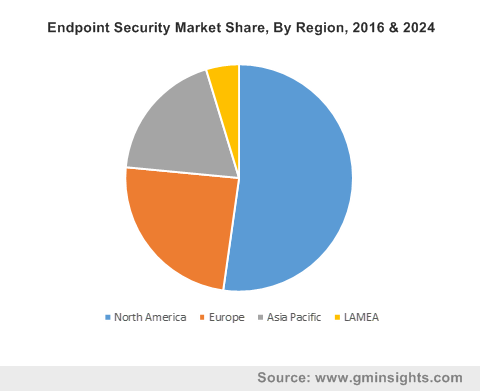 Software-based endpoint security market to accrue substantial revenue by 2024, increasing product deployment in public sectors to stimulate the industry growth « Global Market Insights, Inc.
Endpoint security market, tagged as a revolutionary subset of the smart technology space, seems to have garnered the status of a niche vertical in the recent years. This growth can be precisely attributed to the fact that malware attacks have gained ferocity in stealing identities, draining bank accounts and generally bringing services to a standstill. In May 2017 for instance, a colossal cyberattack sealed down files and badly affected businesses, government bodies and the National Health Service of UK. Unfortunately, NHS back then, was still using an outdated version of the Windows operating system, the consequence of which led to MHS paying a heavy ransom in the form of bitcoins to retrieve the files. This revolutionary cyberattack which was later named WannaCry was an eye opener for the IT sector, which rapidly deduced that such attacks will only become more commonplace in the future if nothing definite and foolproof is done to thwart their onslaught. While numerous other incidences have served as focal drivers, this particular event was speculated to have a direct impact on endpoint security market trends. Endpoint security systems essentially comprise centrally located software, that quite overtly categorizes software as a vital component of this business space. Driven by large-scale installations of antispyware, antivirus, firewall, login authentication and a host of intrusion prevention systems, endpoint security market has much to gain from the deployment of essential software. Indeed, estimates claim that software accounted for 80% of the overall endpoint security market share in 2016. As budgets to improve client threat management witness an increase, endpoint security industry outlook from the software segment is likely to undergo an even more positive transformation. It is prudent to mention however, that the success and effectiveness of endpoint security depends on the proper implementation and updation of the endpoint protection that has to combat with constantly evolving threats. This has consequently added a considerable boost to the service-based endpoint security industry share as well, which is likely to witness favorable growth over 2017-2024. As the threat of malwares is becoming exponential and cyberattacks are increasingly demonstrating how crippling their effect can be, the public sector is changing its approach towards endpoint security. Sectors like BFSI and healthcare have emerged as pivotal growth avenues for endpoint security market, as they have begun to deploy the system in the dynamically changing customer and patient scenario. In fact, the financial institution demands the maintenance of strong web security. Consequently, the BFSI sector has turned to employ multilayered security to provide robust solutions against impending threats. Endpoint security has become a major layer of security as it is software based and is targeted towards user devices like laptops, computers, smartphones and tablets. Therefore, the government has also enforced stringent norms to protect financial data, urging institutions to adopt such a host-based solution. This indeed led the BFSI sector to hold the largest share in endpoint security market in 2016 and lay the groundwork for further progress over 2017-2024. The healthcare sector has also faced threats from cybercriminals who have put patients’ lives on the line by hijacking data and installing malware. The deployment of patient friendly devices for healthcare has created a challenge that required the deployment of robust endpoint security to maintain a safe IT ecosystem. As on today, the healthcare sector has to provide a seamless means of communication and collaboration among stakeholders. Not to mention, the rate of information flow and access has also risen at a commendable pace, increasing the risk of malicious content finding its way into the system. The criticality of endpoint security has thus been recognized to keep patient and stakeholder information safe in the healthcare sector, making it a viable avenue for endpoint security industry. The latest trends in cybercrime rely heavily on social engineering, using legitimate software as cyber weapon, ranging from spam to phishing. Leading endpoint security industry players like Symantec, Kaspersky, McAfee, Microsoft, Trend Micro, Comodo, Cisco, and Panda Security are therefore continually upgrading and expanding their scope through research and development programs to keep pace with the changing dynamics of cyber threats. For instance, Kaspersky Lab recently released its flagship product called Kaspersky Endpoint Security for Business, which included next generation threat detection, increased visibility and granular security controls like credential detection and vulnerability management. This provides an apt demonstration of the efforts being undertaken to innovate highly advanced and efficient products in this business space. As per estimates, endpoint security industry size has been forecast to be pegged at $7.5 billion by 2024. This entry was posted in Sustainable & Smart Technologies and tagged Anti-Malware, Antivirus, Cloud, Encryption Technologies, Endpoint Application Control, Endpoint Security Market, Endpoint Security Market Growth, Endpoint Security Market Share, Endpoint Security Market Size, Endpoint Security Market Trends, Firewall, Intrusion Prevention, Maintenance & Updates, Managed Service, Mobile Device Security, On-Premise, Training & Consulting.